It is time for another 'Tie of the Day'. Today we have gone for the simple yet stylish Plain Gold Super Skinny Tie. 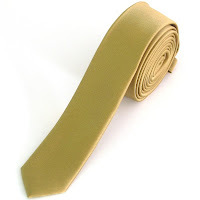 Skinny ties remain very much flavour of the month and there is a huge selection of skinny and super skinny ties at Tiesplanet.com.